Congressional Democrats have criticized the Trump administration's plans. Senate Minority Leader Chuck Schumer (D-N.Y.) told reporters, "The Trump administration is deliberately attempting to sabotage our health care system." In reality, the problem is ObamaCare, not the decision by the Centers for Medicare and Medicaid Services (CMS), which falls under the Department of Health and Human Services (HHS), to reduce the promotional budget and grants to navigators. In February 2013, the Congressional Budget Office (CBO) projected that 26 million people would have coverage in 2017 through the ObamaCare exchanges. Those estimates were subsequently reduced. 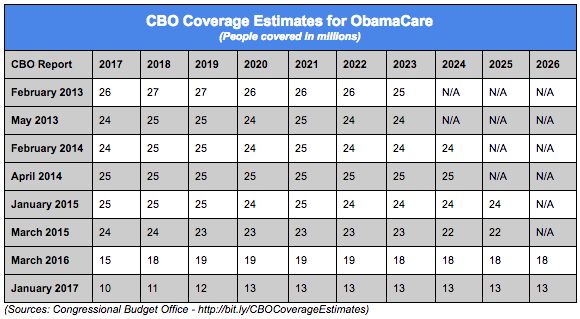 In March 2015, the CBO projected 24 million enrollments in 2017. Instead, a little more than 12.2 million people selected health plans on the ObamaCare exchanges, according to figures released by CMS in March. The most recent update, released in June, showed that 10.3 million people were actually paying premiums, and that figure fell short of the revised projection of 11.4 million. The most recent report doesn't shed light on enrollment by 18- to 34-year-olds, but these much-needed consumers, who are expected to offset the costs of high-risk enrollees, represented 28 percent of all enrollments, far below the 40 percent needed to ensure a stable risk pool. Even the Obama administration acknowledged that it wouldn't meet its coverage projections when HHS lowered projections by 33 percent in November 2014. HHS blamed the reduced estimates on "uncertainty" that there would be a shift away from employer-sponsored health insurance coverage. ObamaCare's Cadillac tax -- a 40 percent excise tax would eventually impact the vast majority of health insurance plans -- proved to be politically unpopular and was delayed until 2020. The decision by CMS to reduce what it spends on promotion and Navigators is the right one. The money spent to promote ObamaCare in the past hasn't produced the enrollment results that CBO projected. Nearly 8.4 million, or roughly 69 percent, of consumers who selected plans for 2017 were considered re-enrollees, and of course, those who signed up for coverage online will receive an alert related to re-enrollment. CMS will use the $10 million allocated for promotion "through digital media, email, and text messages," which, the agency says, "ha[s] proven the most effective in reaching existing and new enrollees." The agency notes that the promotion budget for ObamaCare is "consistent with promotional spending on Medicare Advantage and Medicare Part D," other major government-managed programs. Navigators, who help educate people and guide them through the sign-up process, will receive grants based on merit. A Navigator who meets his or her performance goal will receive the same level of funding the year before. If a Navigator achieved only 30 percent of his or her performance goal, they will get 30 percent of the funding he or she received the year before. CMS spent $62.5 million on Navigators in last year's open enrollment period, with only 81,426 people signing up for coverage. That's less than 1 percent of total enrollments. Of course, it's not really the money being spent by HHS that's the problem here. People aren't enrolling in the originally projected numbers because the health plans available may not have enough provider options, the deductibles may be too high, or because the premiums are too expensive. After all, nongroup health insurance premiums have gone up by 105 percent since 2013, more than triple the increases between 2005 and 2013. Democrats like Sen. Schumer, who doesn't appear to have ever had a career outside of politics, don't seem to understand that pouring more money into advertising doesn't work if consumers reject the product. There are roughly 20 million people who purchase coverage in the nongroup market. Almost half buy coverage off of the ObamaCare exchanges. Maybe -- just maybe -- the product, ObamaCare, is the problem. After playing this game i am thanks for those who made the game https://heartsgameonline.net and also share the platform from here you can know that the whole process of the game that how it could be played.